Owen Farrell runs in to score a try for England against South Africa at Twickenham. 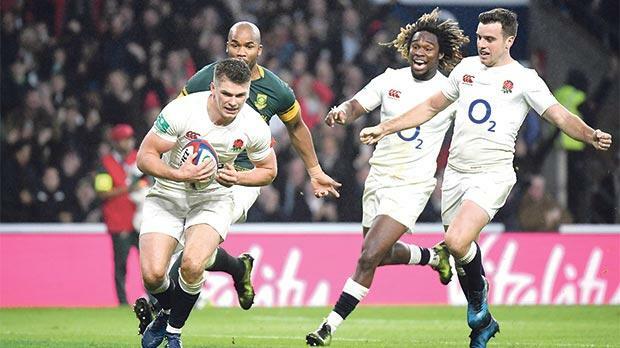 England ended their 10-year winless streak against South Africa in emphatic style yesterday as they outclassed a desperately limited Springbok side for a 37-21 Twickenham victory that made it 10 wins out of 10 under coach Eddie Jones. Two tries in each half, from Jonny May, Courtney Lawes, George Ford and Owen Farrell, were a fair reflection of England’s dominance against a team they had not beaten since 2006. The only time they were in the game was in the opening 20 minutes as Pat Lambie’s boot cashed in on England’s indiscipline. “There’s plenty to work on, so that keeps us grounded,” said England captain Dylan Hartley. In another match, New Zealand ran riot against Italy, running in 10 tries in a crushing 68-10 win that drew a line firmly under their shock defeat by Ireland last week. The All Blacks’ performance in Rome, following the end of their tier-one world record sequence of 18 consecutive test wins at the hands of the Irish, was anything but smooth at times. Yet having rested some of their best players, they were still a class above the Italians, who had hoped for more under new Irish coach Conor O’Shea. New Zealand’s tries were shared across the team, including a double from Malakai Fekitoa and one from debutant Rieko Ioane, with the home side’s only try coming from an intercept with barely 10 minutes to play, Tommaso Boni running away to score. Elsewhere, Australia agonisingly snatched a last-gasp victory over Scotland for the second time in 13 months when they beat their hosts 23-22 at Murrayfield. Centre Tevita Kuridrani’s forceful run and one-armed stretch to touch down on the line gave the Wallabies their second try four minutes from time and Bernard Foley’s conversion sealed the win in Edinburgh. Australia made light of being a man down in the final minutes after replacement forward Will Skelton was sin-binned for dangerous play. Two tries by young centre Huw Jones had raised hopes of Scotland, who lost 35-34 to the Australians in last year’s World Cup quarter-final. Internationals: Italy vs New Zealand 10-68; England vs South Africa 37-21; Scotland vs Australia 23-22; France vs Samoa 52-8; Wales vs Argentina 24-20; Ireland vs Canada 52-21. Nations Cup: Cyprus vs Israel 28-38. Standings: Malta 10; Israel 9; Croatia 6; Cyprus, Andorra 0.